Yes ! you heard it right. Super star Dhanush will soon be joining hands with none other than Tamil hero Vijay for his upcoming film. 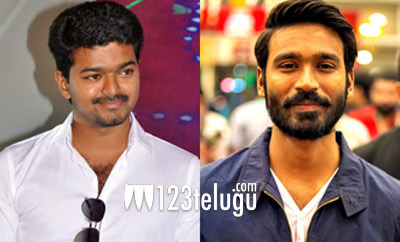 Latest reports from Chennai reveal that Dhanush will produce Vijay’s next film. Interestingly, Dhanush’s brother, Selvaraghavan will be directing this film which will go on floors next year. After hearing the script from Selvaraghavan, reports suggest that Vijay gave his nod right away. Touted to be a fun entertainer, this film will showcase Vijay in a completely new way. Watch out this space for more..